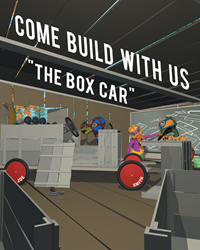 Recent release “Come Build with Us: The Box Car” from Page Publishing author Joe Smith exemplifies what siblings can accomplish when they put their different talents together to work on a common plan. Joe Smith, who holds a bachelor’s degree in Digital Entertainment and Game Design, has completed his new book “Come Build with Us: The Box Car”: a beautifully animated story about Claude, Clyde, and Clara, who are duck siblings that love to utilize their talents in drawing and construction. Published by New York City-based Page Publishing, Joe Smith’s inspiring work starts out on a clear sunny fall afternoon under a tree near the Fort, as Claude and Clyde are looking up into the sky and thinking of something to do. With great amusement, Claude comes up with a great idea that involves not only himself, but also his brother Clyde and their sister Clara. This great idea would have the three duck siblings using their motor skills in drawing and construction, while working as a team. The three siblings work together to build a box car that gives them moments of enjoyment, but they later experience an obstacle that will twirl them into a frenzy when they ride the box car down the bumpy hill. Readers who wish to experience this inspiring work can purchase “Come Build with Us: The Box Car” at bookstores everywhere, or online at the Apple iTunes store, Amazon, Kobo, Google Play or Barnes and Noble.